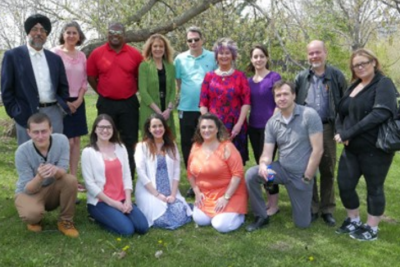 Support and Housing Halton/TEACH on behalf of the Enhancing & Sustaining Peer Support Initiative Mississauga Halton Region is proud to host "The Peer Knowledge Exchange Event." We come together once a year to celebrate achievements and provide opportunities to build relationships, exchange expertise and share resources to continue to build our capacity to expand and sustain peer support work in the mental health and addictions system. Register for this event or download the event flyer. 9:00 a.m. - Warm Up with Emcee Robyn Priest, Chief Communications Officer for Resiliency Unleashed Training and Consulting, and Lead Project Coordinator for Peerlink National Technical Assistance Center in the USA. Getting Grounded: “What Peer Support Work is and What it Isn't”; Robyn Priest, Chief Communications Officer for Resiliency Unleashed Training and Consulting, and Lead Project Coordinator for Peerlink National Technical Assistance Center in the USA. 9:45 a.m. - Keynote Speaker: Dr. Larry Davidson, PhD: Putting “Nothing About Us, Without Us” into Action. Engagement at all Levels: Involving Persons with Lived Experience & Family in Practice and Transformation of Systems. 10:45 a.m. - Inspired Growth-System Transformation Panel: A discussion around system initiatives and developments that are paving the way for more authentic engagement of people with lived experience, family and peer support integration in the mental health and addiction system. Each panel member will provide an overview of the work they are seeing and involved in Regionally, Provincially, Nationally or Internanationally in this area. There will also be plenty of time for Q & A! Robyn Priest-Chief Communications Officer for Resiliency Unleashed Training and Consulting, and Lead Project Coordinator for Peerlink National Technical Assistance Center in the USA. Please register each individual attendee separately. 3. All day attendance. If you will attend the full day conference, you will need to choose ONLY ONE workshop from the EARLY AFTERNOON sessions and ONE workshop from the LATE AFTERNOON sessions. Therefore, if you choose this option to attend for the full day, you should only be choosing TWOsessions upon 'CHECK OUT'. (Please do not choose MORNING ONLY or MORNING ONLY + LUNCH). Ontario Peer Development Initiative Conference - register now! Register for the Annual OPDI general meeting and conference! Submit your nomination for the Ontario Peer Development Initiative's Lighthouse awards or board of directors. Ontario Peer Development Initiative’s Peer Support Conference will be held in Toronto on October 1 and 2, 2018. Are you are interested in learning about Ontario Peer Development Initiative (OPDI) Peer Support Core Essentials™ training?